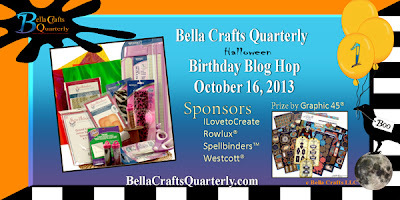 Stampin' Queen Creations: Happy Birthday Bella Crafts Quarterly! Bella Crafts Quarterly is celebrating it's very 1st birthday and you are all invited to help us celebrate!!! 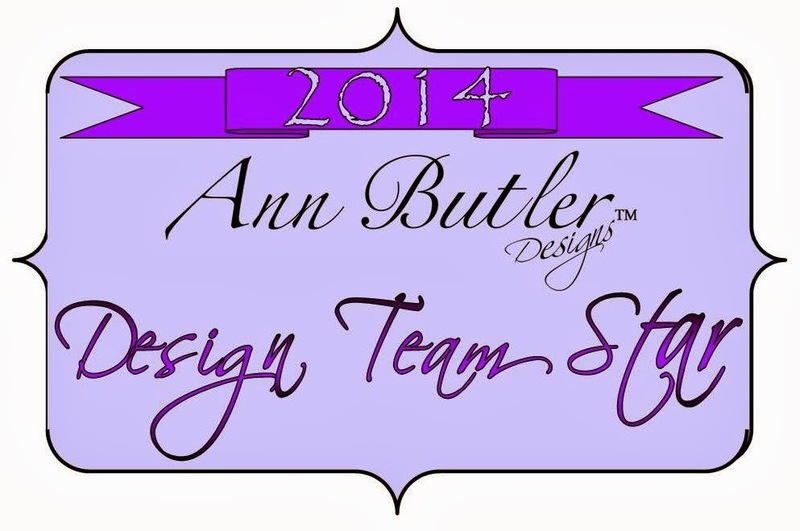 I can't believe that it's already been a whole year since my business partners and designer friends, Ann Butler, Carol Heppner and Theresa Cifali and I began this fabulous adventure! We are having a birthday party blog hop and we would love for you to join us. All you need to do is click on the link and join in on all the fun. We have 15 designers that have each created a project in honor of Bella's birthday. And if that's not enough excitement for you, we also have an amazing GIVEAWAY from Graphic 45!!! We want to thank all of the designers and manufacturers that have given us so much of their time and products. Our birthday hats are off to all of you! And now, without further delay...let the party begin! 1. Cut black cardstock 4 3/4" x 7 1/2". Cut Rowlux paper into tag shape 4 1/4" x 7". Stamp spider webs on Rowlux paper with black inkpad. Apply tacky tape around the edges and add glitter. 2. Cut out rounded squares with die cuts and die cut machine in purple and orange cardstock. Distress edges and stamp swirls and words. Ink edges. 3. Punch hole in top of tag and add fibers. Adhere Rowlux paper to black cardstock with tacky tape. Adhere stamped squares to front of card as shown. What a great card. Thanks for sharing! Adorable. Don't you love using the Distrezz-it-all? I do! Happy Birthday Bella Crafts Quarterly. I absolutely love your card. The fibers up at the top look like a spider! I've had so much fun working with you this year. Happy Birthday! Excited for this coming year. 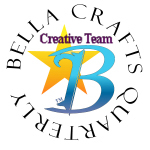 Happy birthday, Bella Crafts, and congrats on a great first year. cute card Lisa- happy bday to Bella! Love your Birthday Card Lisa! Love all those yuumy fibers! Love all those yummy fibers! What a fun card. I love the bright colors. 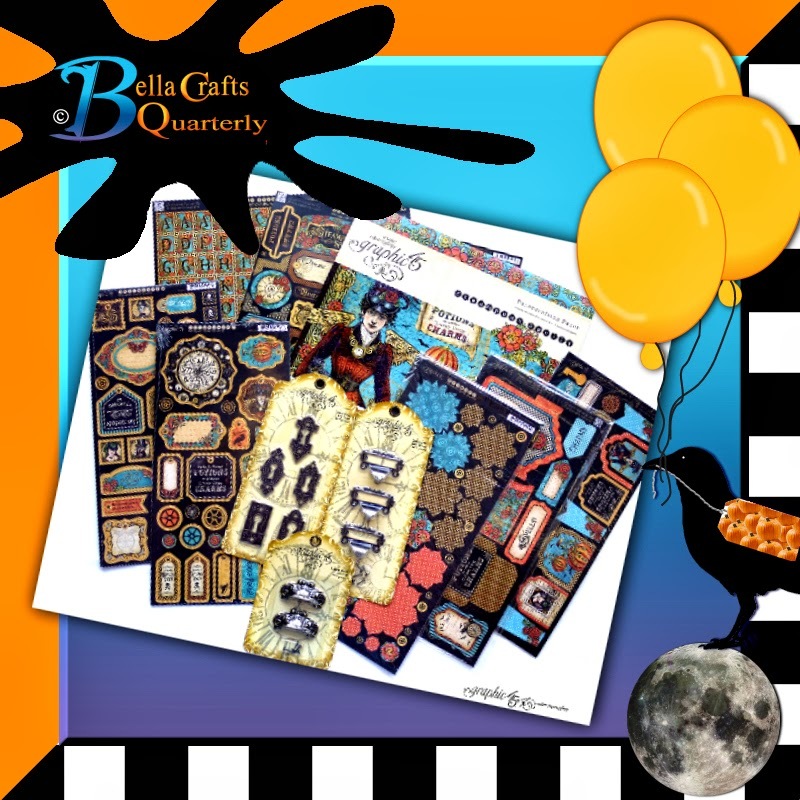 Bella Crafts Quarterly Turns 1 Year Old!!! !